Steven wanted to commission a ring for Jacqueline that would fit with her exisiting contemporary rings. 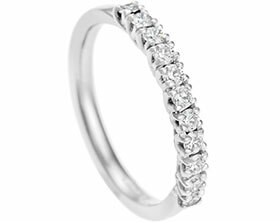 The sterling silver band is a recognition of their silver wedding anniversary. The two central silver bands represent Jackie and Steven, surrounding them are three gold bands representing their children. The three invisibly set diamonds in each of the gold stripes acknowledges the past, present and future of their relationship. The flat profile band and the crisp engraved lines between the metals adds to the clean, modern feel.